I know. It’s the last day of the month, AGAIN. And you know what? This time the photos were already ready in the middle of June. But for some reason, I kept posting about other foods and had this one wait… and now, it’s the end of the month. Anyway, here’s the wagashi for this month. This wagashi is categorized as kinton, which is typically made by coating a ball of an (sweet bean paste) with colorful flakes also made with an. The flakes of an are called soboro and they are made by passing koshian (sieved sweet bean paste) through a coarse sieve. 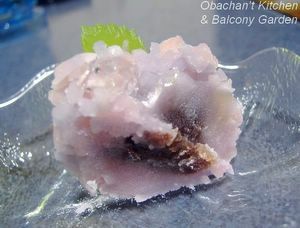 Often yam or kanten gelatin is added to give the soboro a little different texture. To see the photos showing the kinton-making procedures, click here. 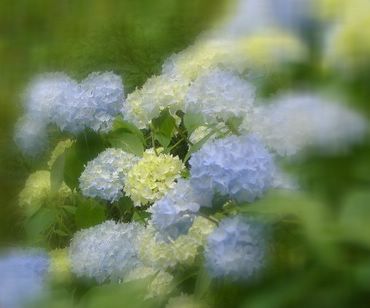 spring haze * This is my favorite. 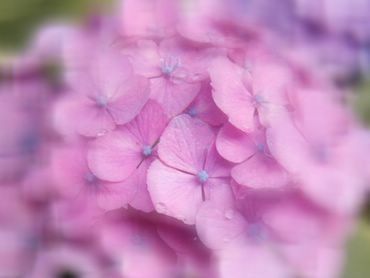 Hydrangea is a gift of the nature that adds elegant colors to our gray and depressive rainy season in Japan. 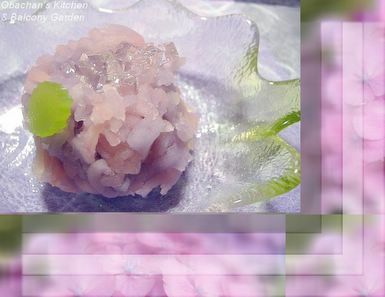 It is a popular wagashi theme for June, and often hydrangea wagashi is topped with some tiny pieces of clear kanten jelly which represent the dews on the flowers. Gomen, Obachan -- I don't mind to impose -- I was wondering if I make ask what "sapporo" means. Your talk of soboro reminded me of the term. My favourite Toronto sushi place is called Sapporo Sushi, and I've seen that word used for other sushi places, but I have no idea what it actually means. As usual, your photography is striking. Kinton sounds like it would be tasty. I love the sweet bean paste buns I pick up in Chinatown, mostly because of the bean paste itself. Sapporo is a name of a city in Hokkaido, the northmost island of Japan. I'm not sure why it is used in the name of a sushi place. Maybe the owner is from that city?? as usual, the wagashi look precious and elegant. 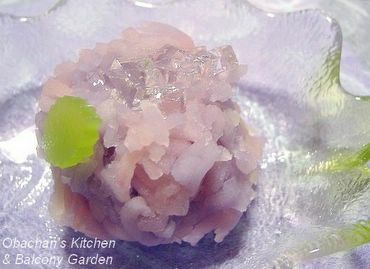 but, do you have any recipes you like to use for homemade wagashi? and i just had to comment here too - what absolutely beautiful wagashi! Thank you, Obachan. It's very much appreciated. It's strange, 'though, because I'm pretty sure the owner is actually Korean. All of the wait staff is. That happens a lot in my neighbourhood, actually, where there will be a Japanese place run by Koreans. My local Japanese supermarket is run by Koreans too. Yeah, I have several recipes that I stole from my sister. :) And also the ones I got from some websites.